Leonardo was studying for an MA in Graphic Design when he entered the 2010 Student Business Plan Competition for his idea of an innovative guidebook souvenir called 24 Hours in London. With a background in design, Leonardo was able to produce his guidebook to the highest standards and in turn impress the expert judges at the competitions final. 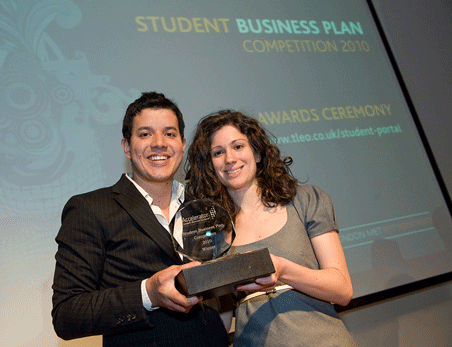 A unique concept with engaging characters put Leonardo in a clear position to win the 2010 Business Plan Competition. He received £2500 in cash and another £2500 in kind support from the Student Enterprise Programme, which consisted of office space in the Hatchery at London Met’s Business Incubator, Accelerator. Since winning the competition and gaining support from the Student Enterprise Programme, Leonardo’s 24 Hours in London has gone through many changes. Expert advice has given him a clearer focus and encouraged him to consider a younger audience for his book, while simultaneously adding extra values to better attract his target market. I learned so much through the Student Enterprise Programme, including how to produce a proper Business Plan, how to give effective presentations and how to distinguish an idea from a real business opportunity. The whole experience has enabled me to grow both personally and professionally. In addition to 24 Hours in London, Leonardo is also focusing on his design business, Cup of 3, which is currently a partnership with two other students from London Metropolitan University. Cup of 3 offers a range of design approaches, including Graphic, illustration, advertising, product and furniture.